Me Made May 14 – The final week! Wow I can’t believe we have reached the end of Me Made May already! 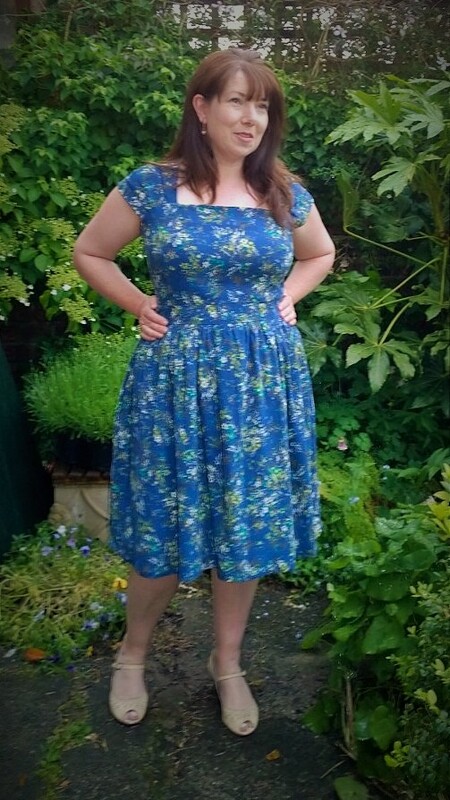 For the final week I was kind of hoping for some sunny weather so I could dig out some summer dresses, but the temperature here in the UK has dropped considerably and it has rained for most of the week! As I had pledged not to repeat any outfits I really had to fish around in the back of my wardrobe for things to wear! Day twenty five: Megan Nielsen Darling Ranges Dress. This was actually my second wearable muslin for this dress, the first one was a complete disaster and was not even remotely wearable! I kind of ended up redrafting the bodice and moving the bust darts to the waist which worked out OK on this. I think I took another inch out of the bodice length when I did my final silk version (worn on day four). Not sure about the fabric but it is kind of comfy in a ‘knocking about the house’ sort of way! 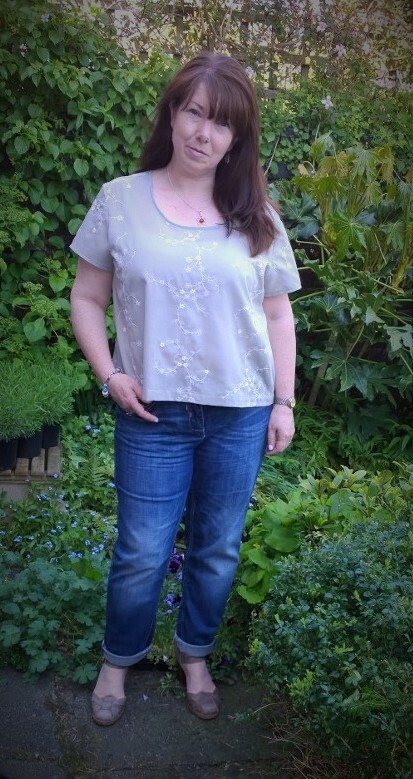 Day twenty six: Burdastyle Cream cotton voile top. It’s a real shame this hasn’t photographed very well, the fabric is a very fine voile with palm trees printed on to it! I bound the hem, neck and sleeves in cream satin bias binding. It’s completely see through so I need to wear a white vest underneath but looks OK in a layered sort of way! 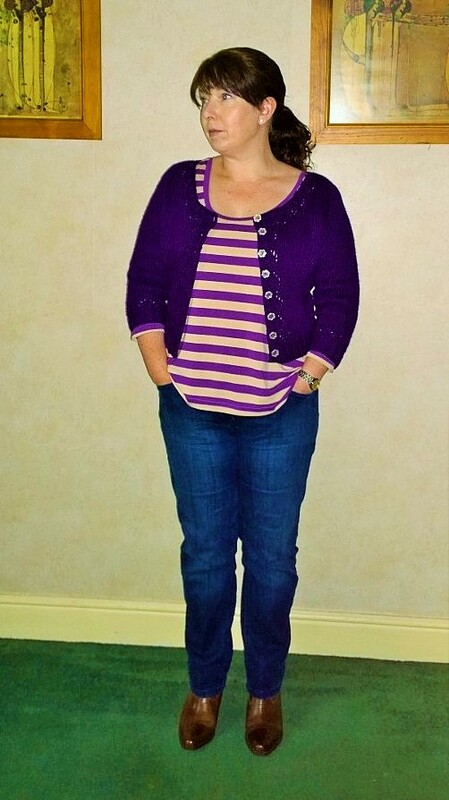 Day twenty eight: Purple Miette Cardigan and stripe Deer and Doe Plantain. Absolutely tipping it down with rain all day so definitely dressed for warmth here! 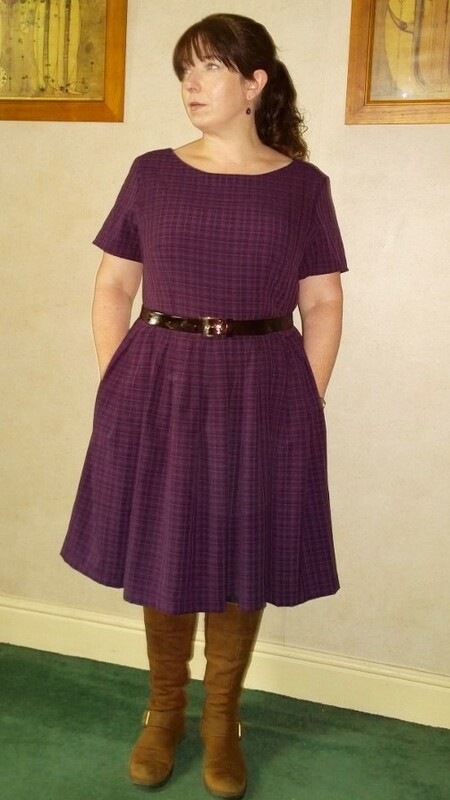 Day twenty nine: Christine Haynes purple check Emery dress. 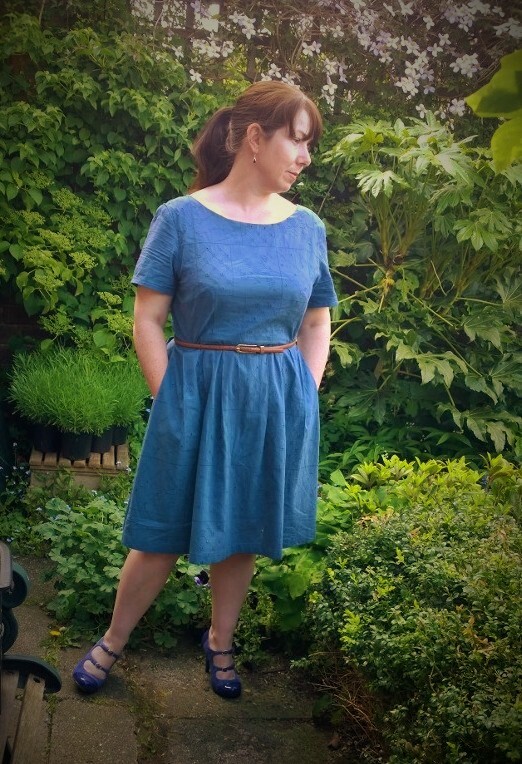 This was my wearable muslin for this pattern but I think I actually prefer it to the subsequent blue broderaise anglaise version (day sixteen) The only downside was that it is 100% polyester and melted when I first tried to iron the fabric! I had to use such a low heat that it didn’t hold a crease very well. I love the colour though! Day thirty: Grainline scout tee (whipped up with fabric languishing in my stash for well over a year!) and my Green Miette. I really love my Miettes! Day thirty one: Sewaholic Cambie dress and also Burdastyle Pirate shorts! I made these for my son as he went on a pirate themed Scout camp last weekend, they seem to fit OK so I will have to look out for some fabric to make a few more pairs (another excuse to go fabric shopping!). 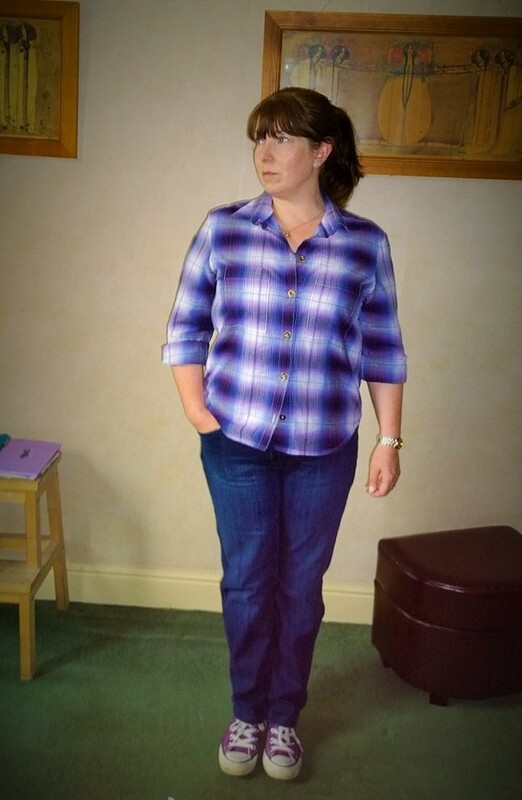 This was my wearable Cambie muslin (blogged below). 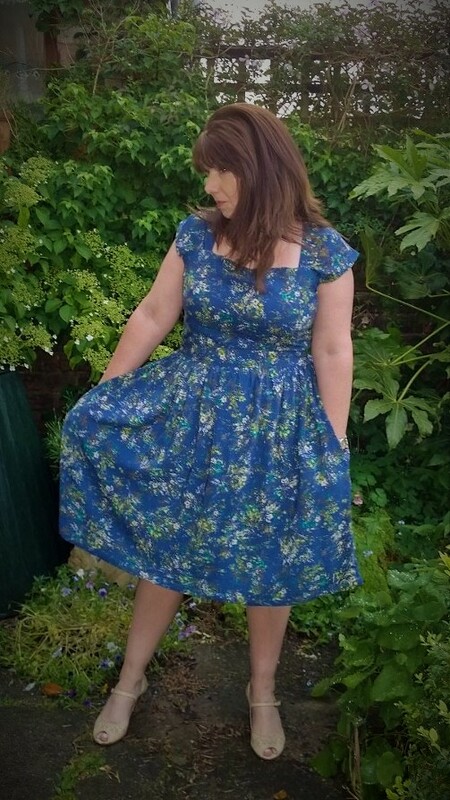 I’ve got some Liberty tana Lawn to make the final version which was a present from my Mother in law, I just need to pluck up the courage to cut into it! It has been so heart warming to see everyone’s pictures each day and the fabulous things that they have made. I’ve gained a lot of inspiration from everyone (and have also added at least 10 patterns to my wish list!). The sense of community has been wonderful, there have been some lovely comments and having the opportunity to let people know how fabulous they look has been great. 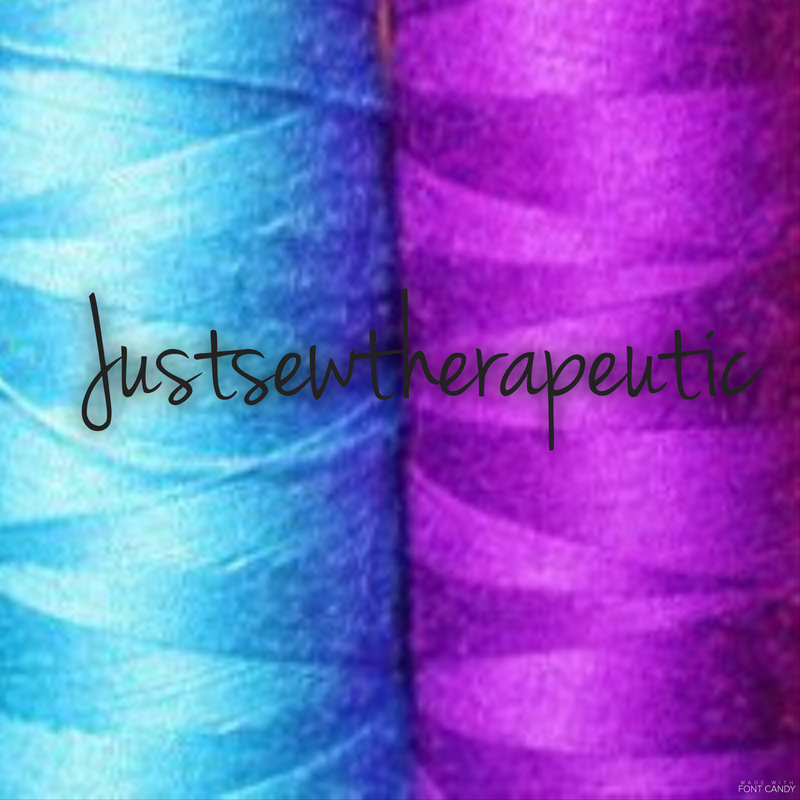 I have also discovered some great new blogs so I can continue to see what everybody’s sewing! I think it has been a major turning point for me too. I am renowned for avoiding having my picture taken at all costs so to take one very day was a big step for me. It’s made me realise that I don’t look as gormless as I think I do (and it helps if I don’t look directly at the camera! 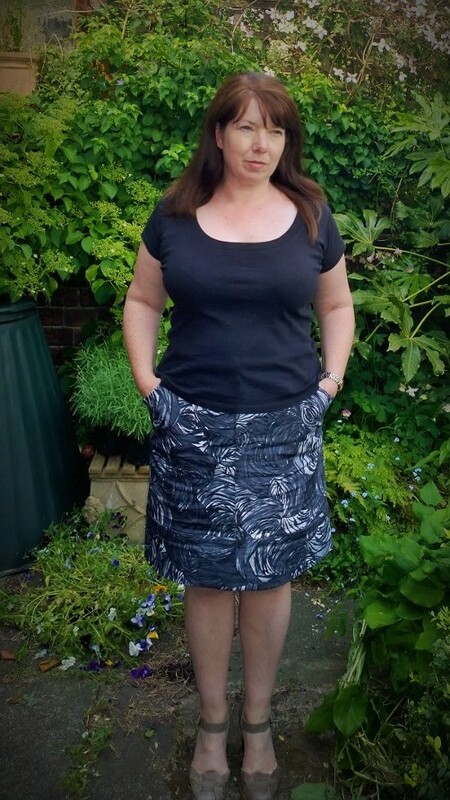 ), that you can’t really see all the lumps and bumps when your dressed, that I suit some clothes more than others and that I should really just chill out and not worry so much about how I look. I’ve also got a record of all the things I have created and I can appreciate all the love and time I have put into them! So the biggest ‘well done’ to everyone that took part, I’ve had so much fun and you all look fabulous! Have you made any major discoveries by taking part? Last Christmas I decided to be really pro-active about presents. I’m usually the kind of ‘surprise me’ person, I always think it’s a bit rude to ask for things for some reason. However, my previous attitude used to result in flummoxed relatives with no idea of what to get me. Consequently I’d end up with slippers, PJ’s and an array of smelly bath stuff! 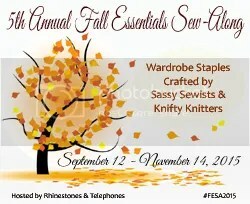 Last year my list of want’s consisted of sewing patterns and fabric! 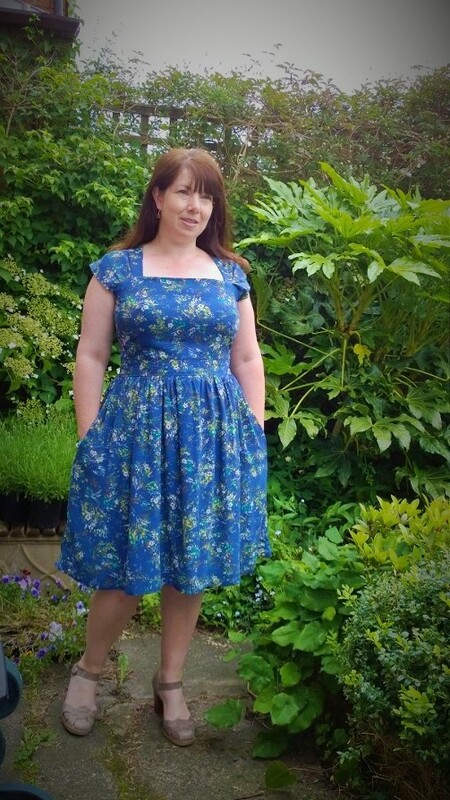 My Mother-in-law kindly got me the Sewaholic Cambie Dress pattern and three metres of Liberty Tana Lawn. Now I have to admit I have been a little apprehensive about starting this project, mainly because I didn’t want to ruin such lovely (and expensive) fabric! However with summer on the way and questions about when I was going to get it done I could put it off no longer! I decided the best course of action was to do a trial run in something a lot cheaper that I didn’t mind if I made a hash of! This is generally my habit when I am trying a new pattern, I am too impatient to make a toile so I generally just dive in with what I suppose you could call a wearable muslin. I have realised that I am short waisted so I always take an inch off the length of the bodice but other than that I just trace the size closest to my measurements and wing it! I picked up this Blue fabric a few week’s ago specifically to make my first Cambie with, I’ve no idea what it is but would guess at Rayon as it is very drapey! I went for view B. As it calls for a full lining I planned to use some buttery soft white cotton that I’d got five metres of in my stash. I decided however to just use this to line the skirt and then line the bodice in my main fabric. (didn’t want to risk the lining peeking out!) This dress eat’s a lot of fabric! It took three and a half metres to cut the main dress and bodice lining and a further metre and a half just to line the skirt! I cut a size 14 as that seemed to fit my measurements. 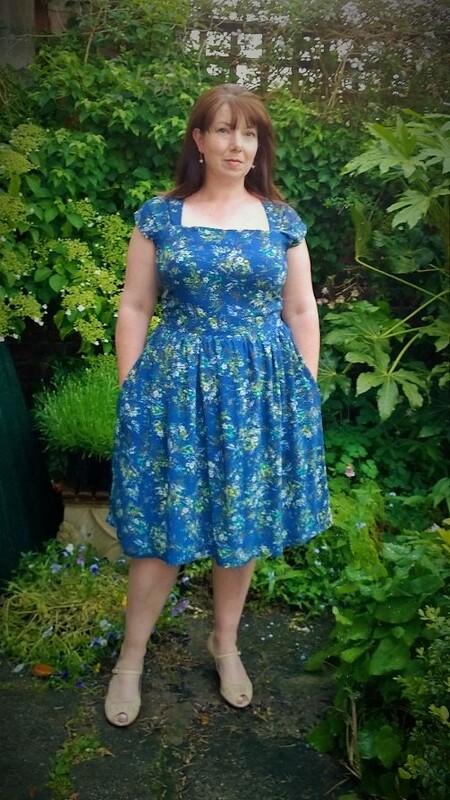 I was a little unsure about the sweetheart neckline, thought it might emphasise my bustyness too much so I redrafted the front bodice piece to form a straight neckline. Now I seem to have developed a fear of sewing things that are too small, I keep muttering the ‘trust the measurements’ mantra but I’m always worried that I’ll spend so much time making something that is unwearable (this happened with a By Hand London Charlotte skirt which I couldn’t zip up for love nor money!). As I was sewing the bodice pieces together I decided to keep my seam allowances as small as possible (about 6mm) my thinking being that it would be easier to take in than let out! The dress pieces and the lining pieces are identical apart from the sleeve lining piece. 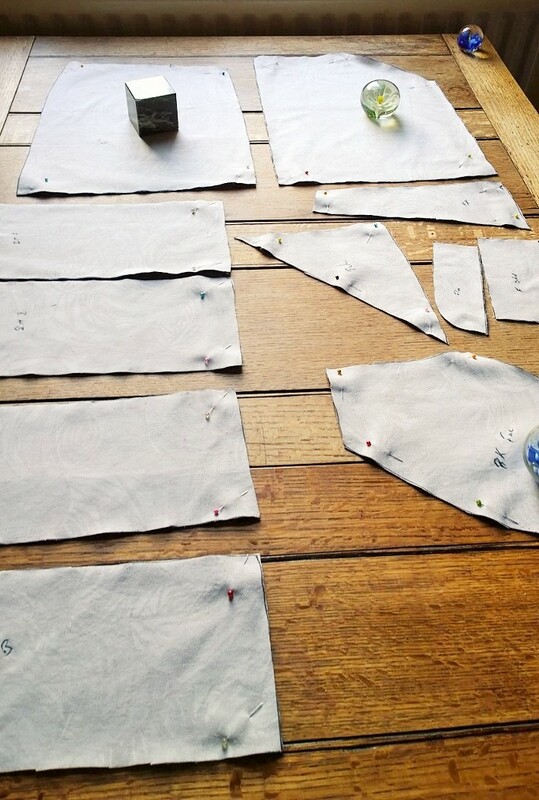 You are essentially making two dresses before sewing them together along the zipper and bodice top and sleeves. When it came to attaching my bodice and skirt to the waistband I had a bit of a panic. I tried the waistband around my waist and it only just met…. hmmm. Just to be on the safe side I recut two more waistbands adding two more inches for good measure! After sewing everything together I decided to try it on for size and guess what? It was about two inches too big! I really should just have faith in the measurements given on the pattern envelope! I had to take an inch of each side from the underarm, through the waistband and skimming to the top of the pocket. Tried it again and it was spot on! The next step was to insert the invisible zipper. Learning from my wrinkly Anna zip I cut two strips of fusible interfacing for the centre back. The first side went in like a dream but the second was a complete pig! I had decided to start sewing the second side from the waistband down so I could get a good match but it just wasn’t happening, I had to unpack it three times, by then the interfacing had been unpacked to death! 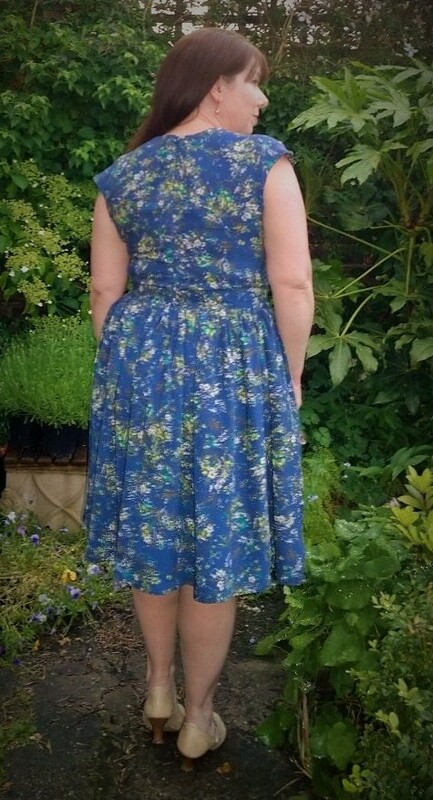 I eventually settled for ‘good enough’ even though there is a slight wonky bit at the waist! For some reason it is really tricky to zip up but no problem to unzip, at least I’m not going to have an attack of claustrophobia trying to get out of it! Overall I’m more than happy with this dress. I think the straight neckline adds a little more modesty (and helps to contain the girls!) Will do the same adjustment on my ‘proper’ dress. Now I just have to pluck up the courage to cut into the Liberty, I shan’t show you which print it is yet, you’ll just have to tune in next time to see! 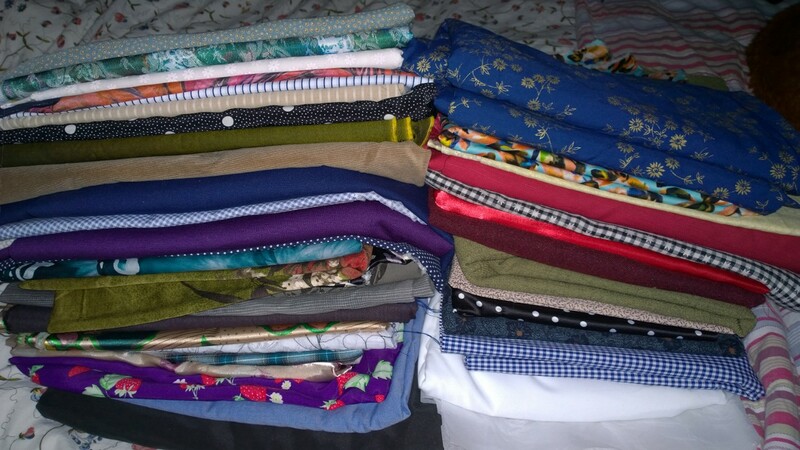 Have you got any fabrics in your stash that you are too scared to cut into? Well we are moving into the last week of Me Made May already. The sun was shining for the first part giving us a chance to get out those summery things but the past two days have turned on the rain and I’ve had to pull on the tights and boots again! 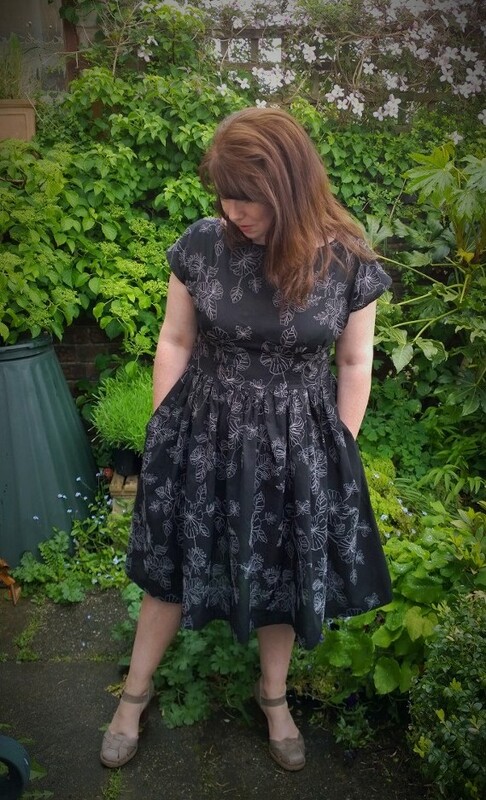 I’ve managed to stick to the no repeat pledge but I must confess we are off out for a rare night on the town tomorrow and I desperately want to wear my swishy Anna dress again! (I’ve finally persuaded the other half to go to the Japanese restaurant I went to on a girls night out, he’s not keen on Sushi but it’s my turn to choose!) I figure I can be allowed one repeat if I wear something different in the day? Anyway, this week has been a mixed bag of outfits, some more successful than others! 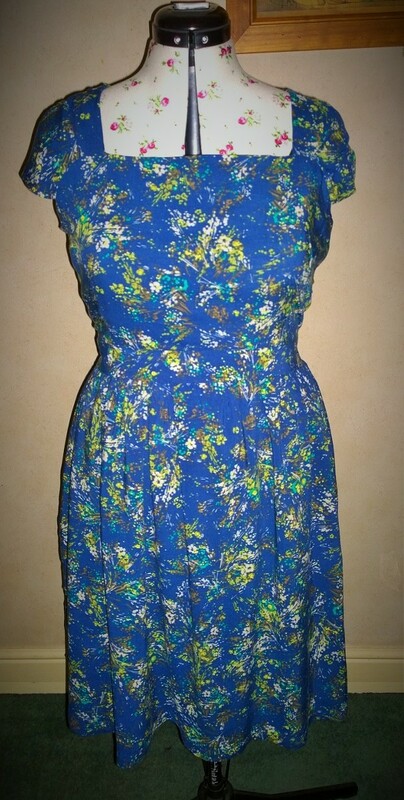 Day sixteen: Blue Broderie Anglaise Christine Haynes Emery dress. 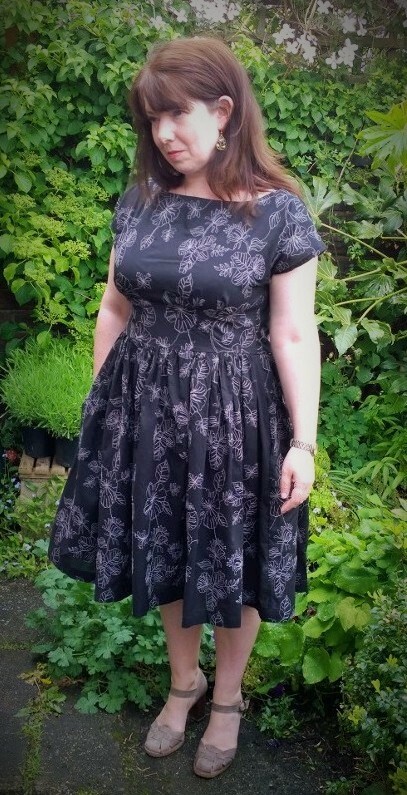 This is my second Emery (will try and fit in the first before the month is out) Really like this dress, it’s very comfortable to wear but it does crease as soon as I think of sitting down! 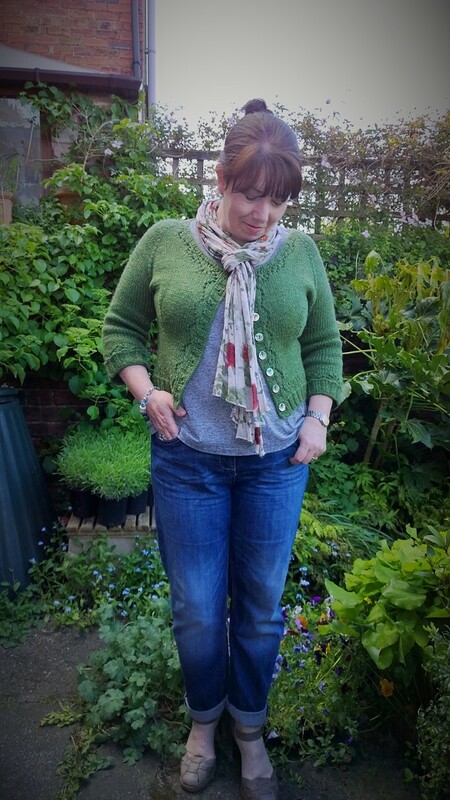 Day seventeen: Green Linen Colette Hawthorn. 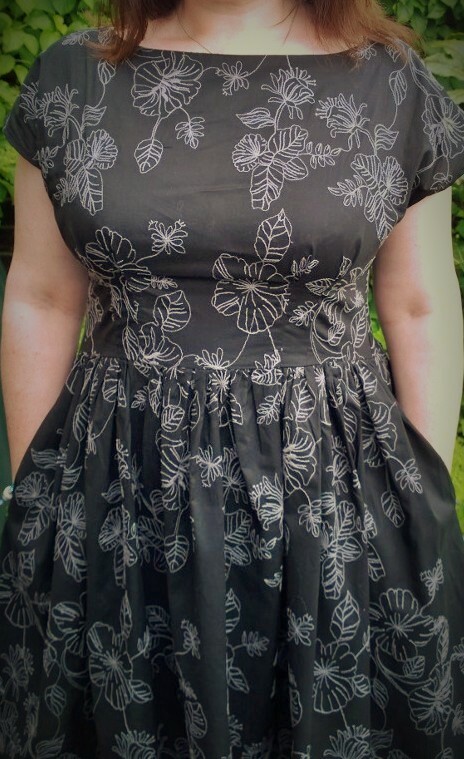 My first Hawthorn and I really like this dress (even though it doesn’t have pockets!). It is Linen though so creases a lot. Also I’ve never quite managed to press the waist darts flat so it does have the pointy nips problem! Day eighteen (Sunday) Red Colette Sorbetto. Not quite sure about this but we were pottering about at home and then up to the allotment so it was a case of ‘it’ll do’. I liked the fabric but it is a quilting cotton and quite stiff so I feel a bit like I’m wearing a cardboard box at times! Day nineteen: My newly made Macintosh Grainline Moss Mini. 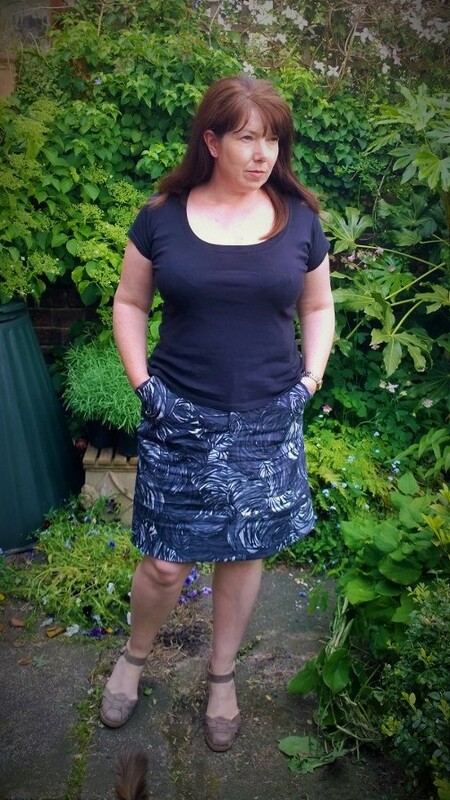 I do love this skirt and it was very comfy to wear, I’m really not sure I should have worn it with that T-shirt though (and I could have done with a better Bra!). I think next time i’ll try a white shirt during the summer. 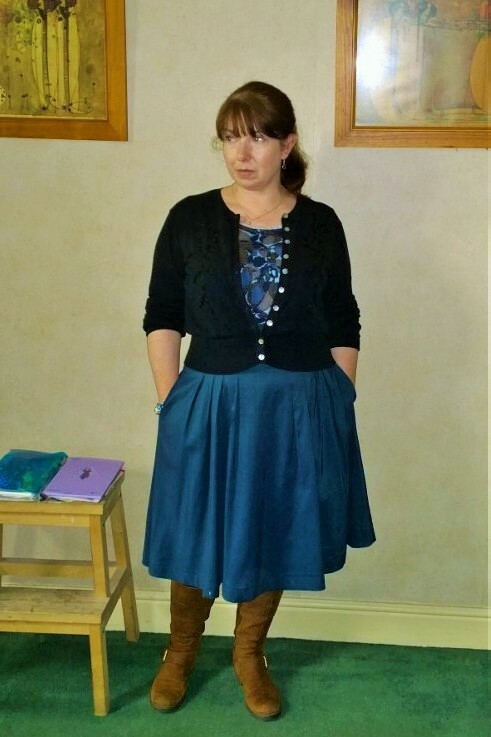 I think it will get a lot of wear through Autumn and Winter though with black wooley tights and a black boat neck sweater. 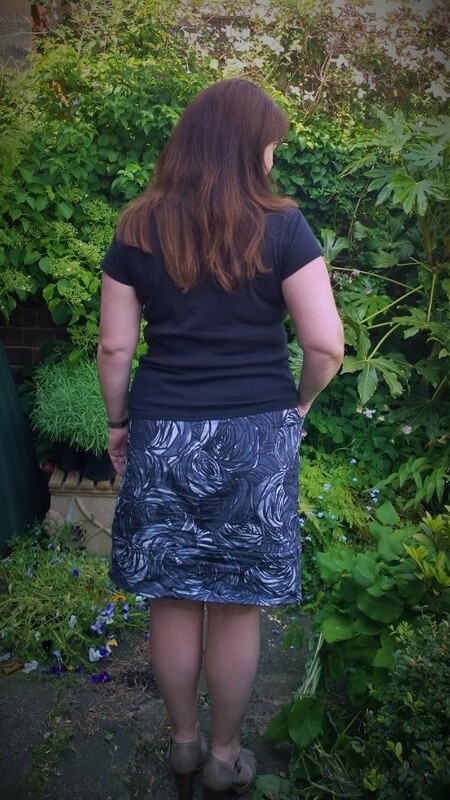 Day twenty: self drafted A-line skirt. Hmm… you know when you have one of those days when everything feels wrong? This was a bit of a rush job, I decided I was going to wear the skirt the night before and thought I’d put a plain white shirt with it. When I came to get dressed the next morning (5 minutes before I had to get out the door). The shirt looked too long left out and I didn’t feel comfortable with it tucked in. I resorted to grabbing a white vest (which you cannot see in the photo as it has blended into the whiteness of my chest!) 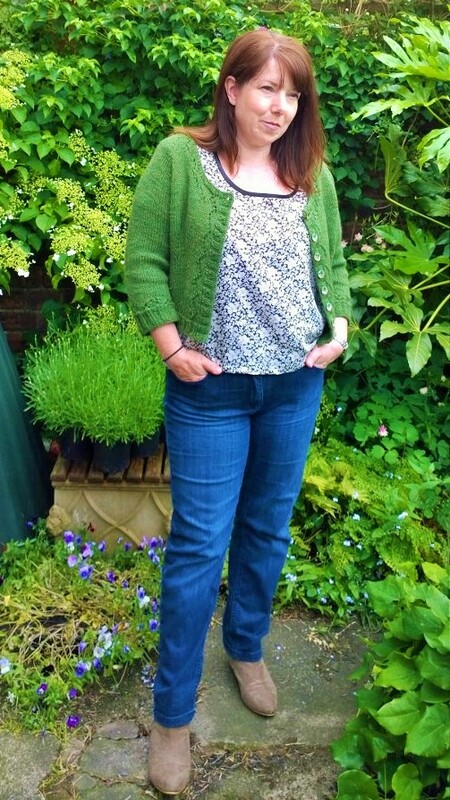 and the blue cardigan and ran outside for a quick picture. 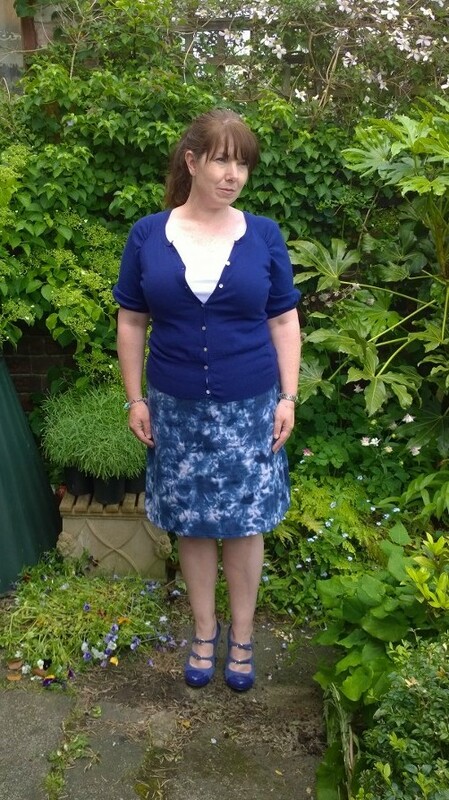 Faced with photographic evidence I realised a, I should have stuck with the white shirt and b, that blue cardigan has got far too small for me (or rather I have got too big for it!) It’s now in the charity shop bag! I did however like wearing the skirt and surprisingly I have never worn it before, even though I made it over a year ago! 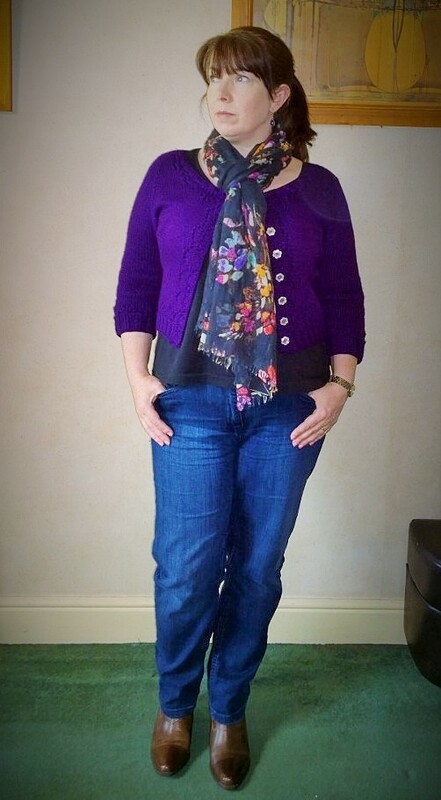 Day twenty one: Purple Miette cardigan and Blue Sorbetto. 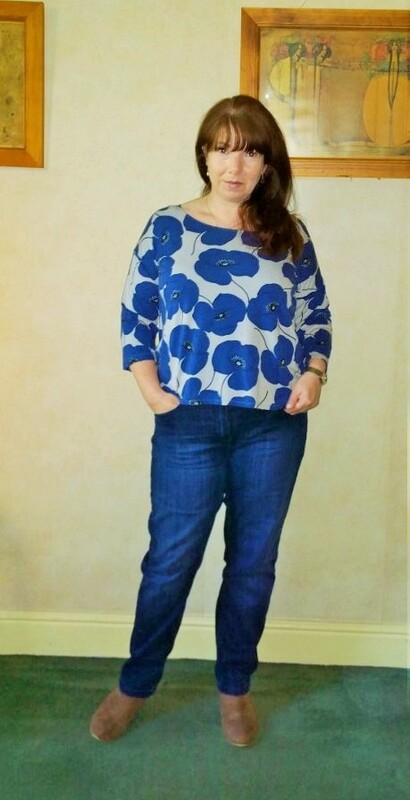 I like this top as the cotton fabric is a bit more drapery so it hangs a lot better. 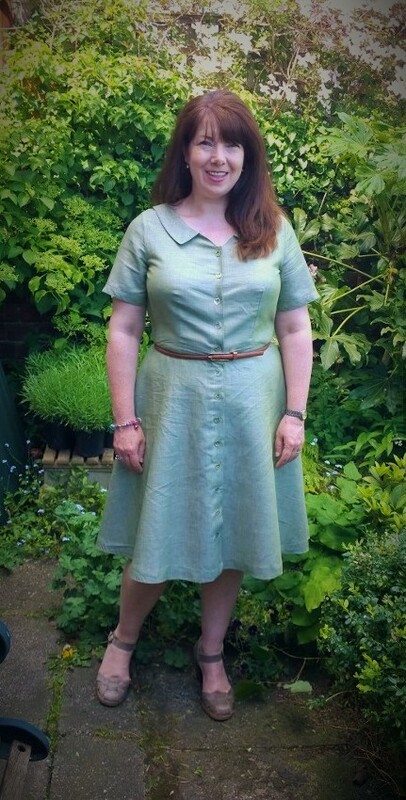 Day twenty two: By Hand London navy Anna dress and green Miette. Woke up to find it raining heavily! 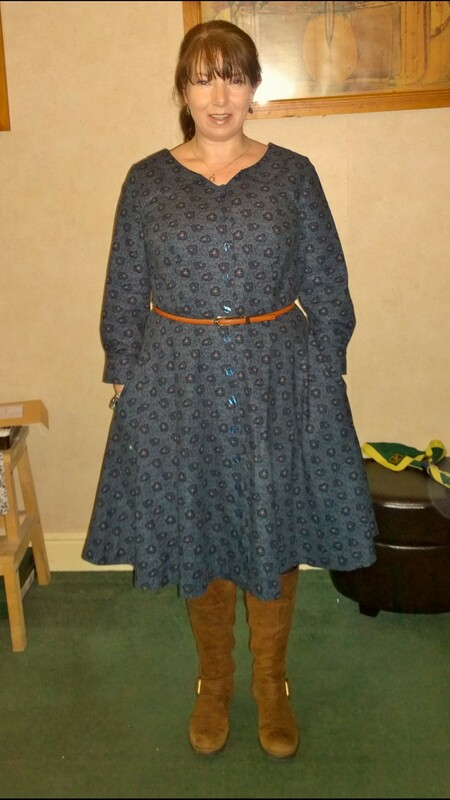 Determined to wear this dress though so out came the boots and black tights and the old faithful green Miette. Felt really comfortable in this as it was ‘me’. One thing I’ve noticed over the past few weeks is that when I am wearing something I really like I feel a lot happier and have a better day! Looking back over the photo’s from the past few weeks I see how I feel when wearing different things. 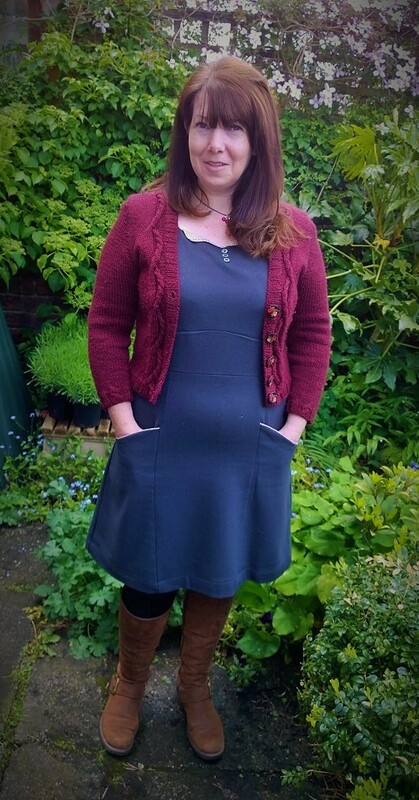 It’s hard to explain but I think feeling comfortable and confident in your clothes just enables you to get on with your day without fidgeting, breathing in, pulling down hems and being self conscious about lumpy bits! Day twenty three: Friday theme ‘polka dot parade!’ Denim Megan Nielsen Kelly skirt with navy and white polka dot buttons and pocket lining’s, stripey Grainline Hemlock Tee and Levi’s spotty cardie (worn with a navy and white spotty scarf and cream and navy spotty raincoat, just to make sure I’d properly covered the polka dot theme!) 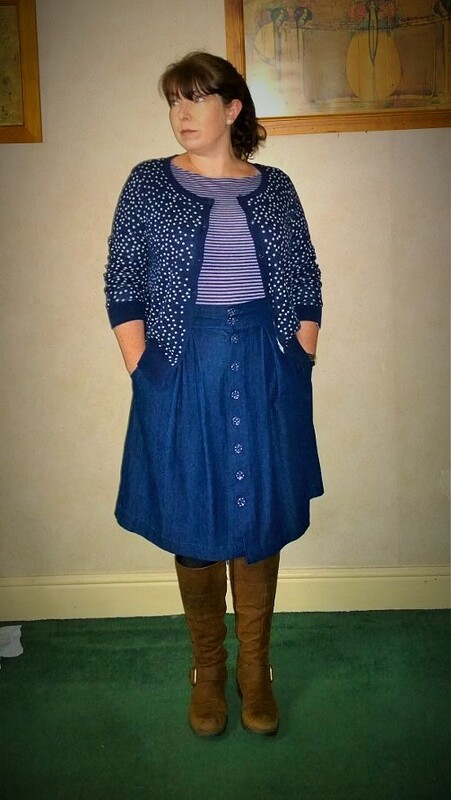 I do have quite a few polka dot scarves and cardigans but surprisingly this skirt is the only thing I have made with polka dot’s! Will have to remedy this! 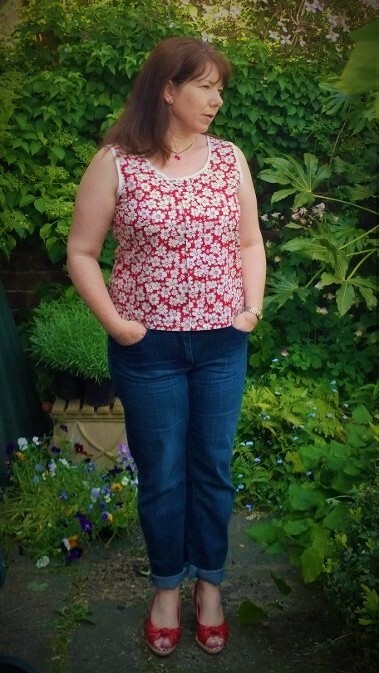 Also wore my Hemlock tee which I made using two back bodice pieces to make a boat neck. Quite happy with this and I love wearing spots and stripes together, must be the rebel in me! I can also report that I have indeed been wearing my me made knickers all week, not the same pair!, I’ve now got 7, I’m fighting the urge to put days of the week on them! All in all I don’t think I’ve done too badly this week, i’ll have to see what I can conjure up for the last week! How are you getting along with your me made days? Have you had any major revelations about which clothes feel like ‘you’? I had been admiring the Grainline Moss Mini for a while now. It is the same style as a black moleskin skirt I had in my twenties and wore to death. 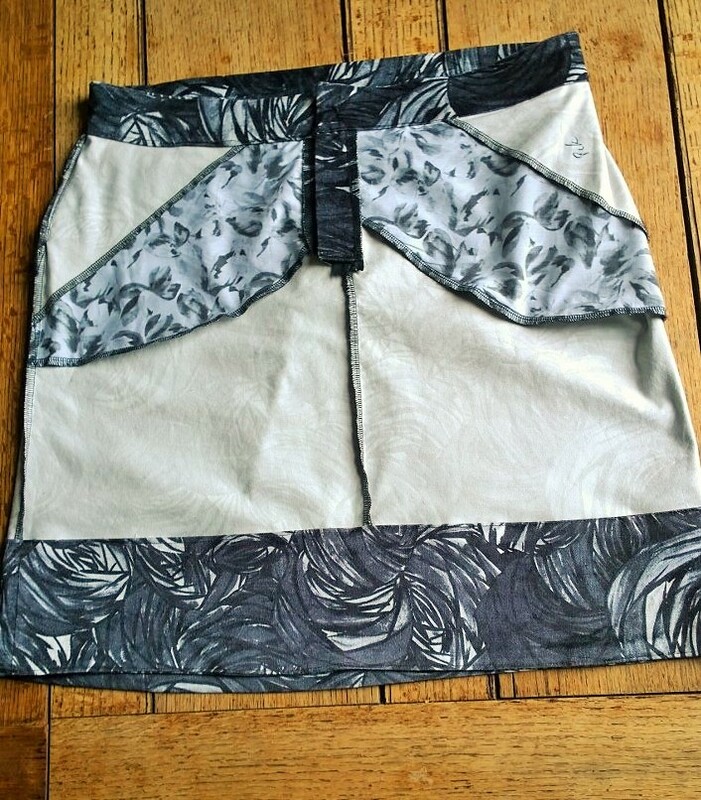 I’ve also got a needlecord Fat Face skirt which is a very similar design and which has also been worn to death. 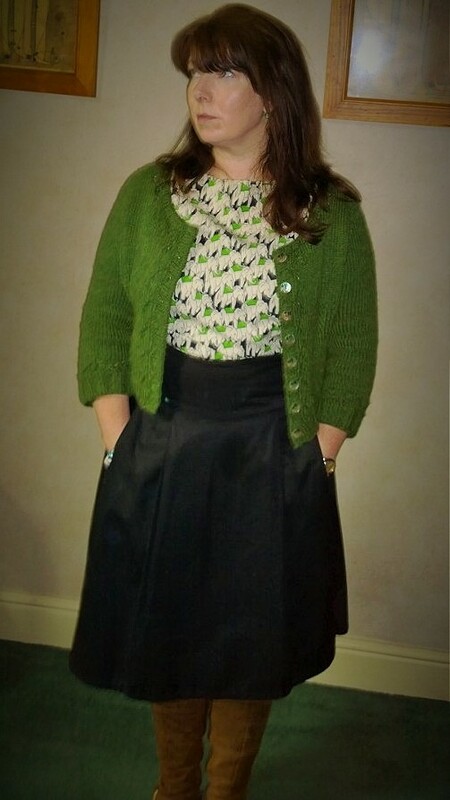 I feel really comfortable in this style of skirt and they suit my shortness so why didn’t I jump on the Moss earlier? Because I have an irrational fear of the Fly Zipper! 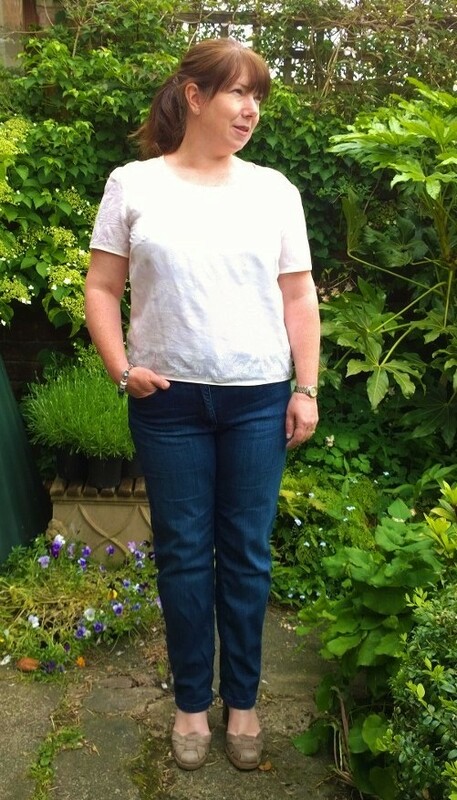 I’ve looked at fly zips in jeans and other RTW trousers and just couldn’t get my head around how it all fits together! However, after successfully sewing my first Archer Shirt, quickly followed by a couple of scout tee’s and as I was so impressed with these patterns I decided to take the plunge and make a Moss. 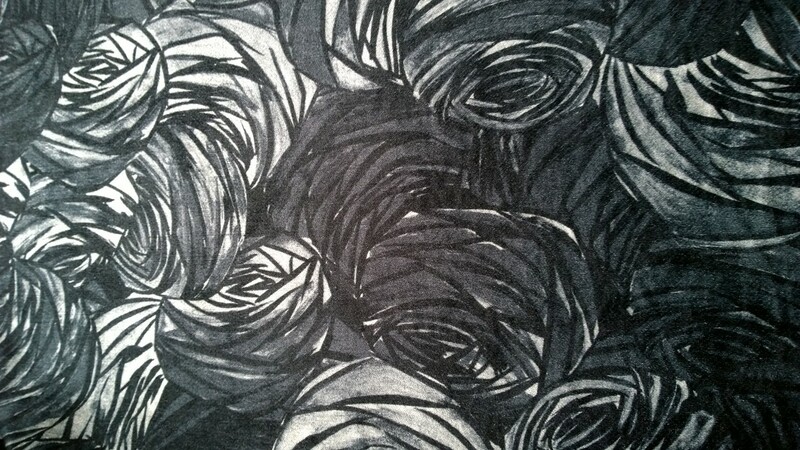 I have had this fabric in my stash for nearly a year now and had originally planned to make a Colette Meringue with it, I thought the swirly roses would look good with the scalloped hem. I think I was never that enthusiastic about it which is why it was still in the stash. 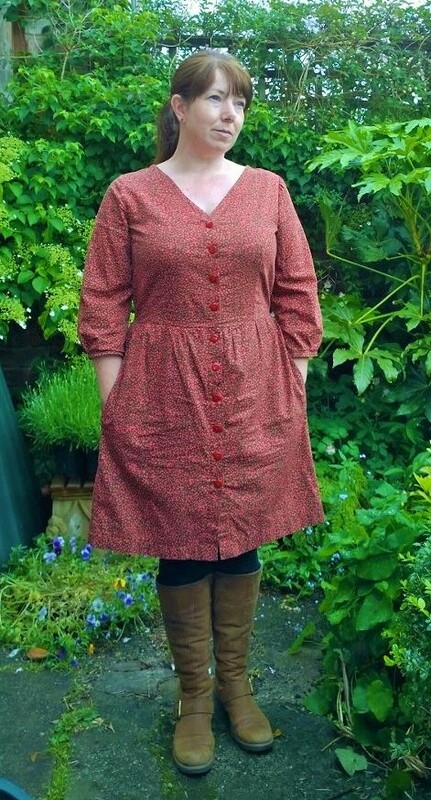 I did have the same fabric in bright reds and pinks which I made up into a shift dress. It’s more pronounced in the red but I think the swirly flowers look a little like Charles Rennie Mackintosh’s roses (hence the Mackintosh Moss!). Don’t know what it’s made of, it’s got a bit of stretch to it, it’s white on the reverse and the pattern has a one way nap so it feels a bit like velvet. 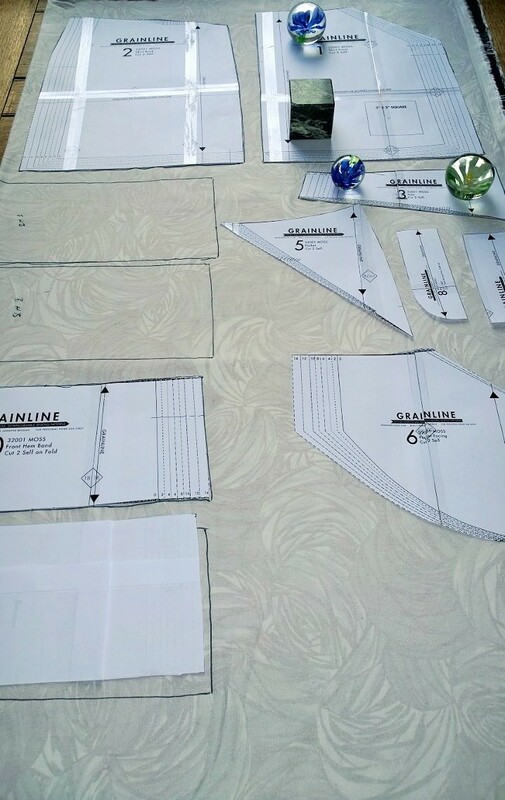 Cutting out was super speedy, I weighted the pattern pieces down and drew around them in felt tip pen! 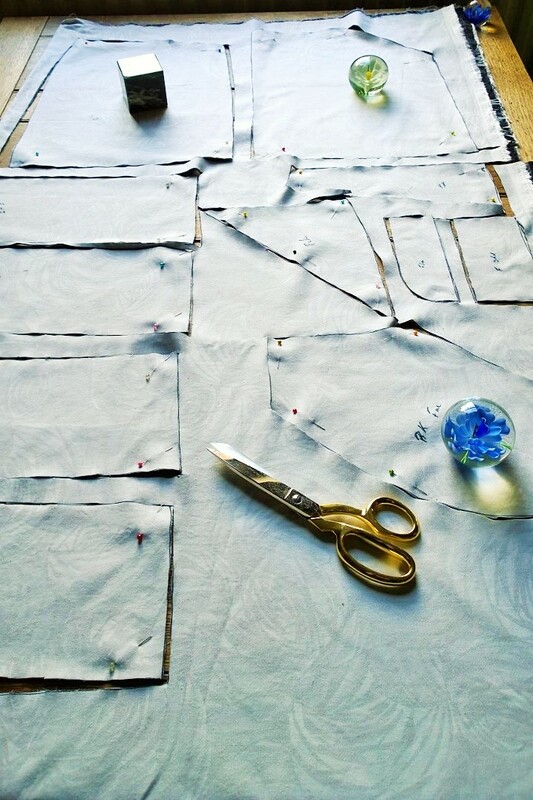 I then pinned the double layered fabric together and cut it out all in one go! I also labelled each pattern piece, nothing worse than spending ages trying to figure out what the weird shaped pattern piece is and where it goes! I’m really pleased with how this worked out and would seriously recommend any of Jen’s patterns, they all go together so well. 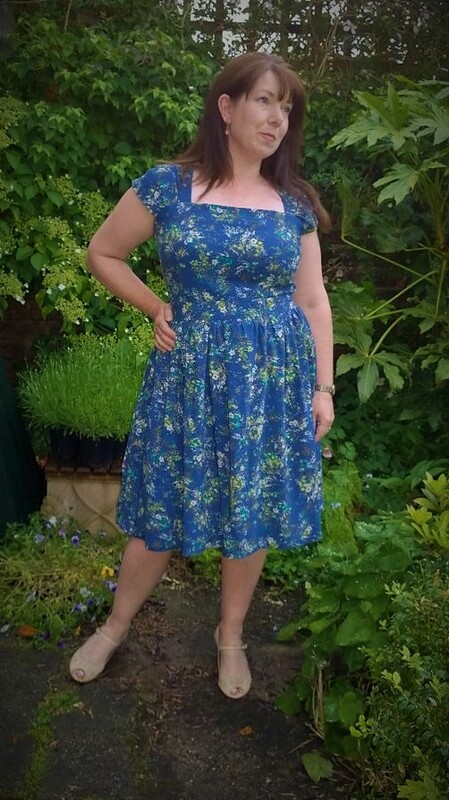 I think this will prove to be a well worn make, I wore it today with bare legs (so brave) but it will also look OK with some black opaque tights so I can carry on wearing it through Autumn and Winter! I have now also overcome my fly zipper fear! 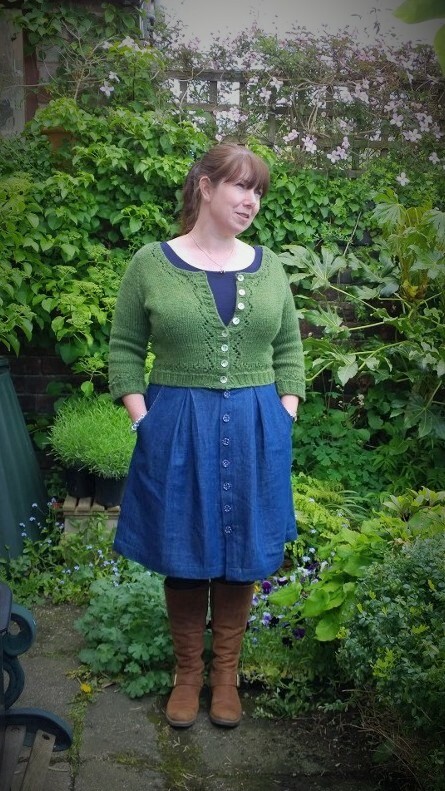 Now I’ve just got to work on my full bust adjustment (tried it with Rooibos – Disaster!) Is it just me or does anyone else have an irrational sewing fear? Me Made May 2014 Midway point! Well we are halfway through Me Made May and so far so good. 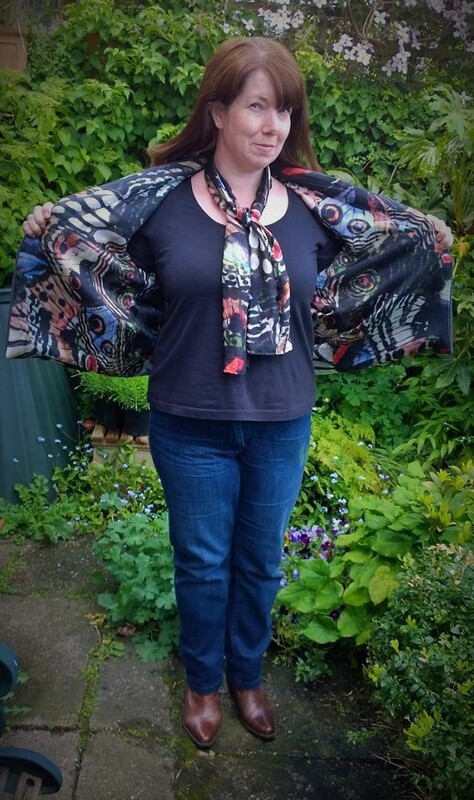 I pledged to wear at least one me made item a day, along with me made knickers and me knitted cardigans at least four days a week. I also decided not to repeat any outfits throughout the month, things are starting to get a little bit creative! I’ve been posting daily picks on Flickr and Pintrest but I thought I’d do a bit of a round up here too. Phew! 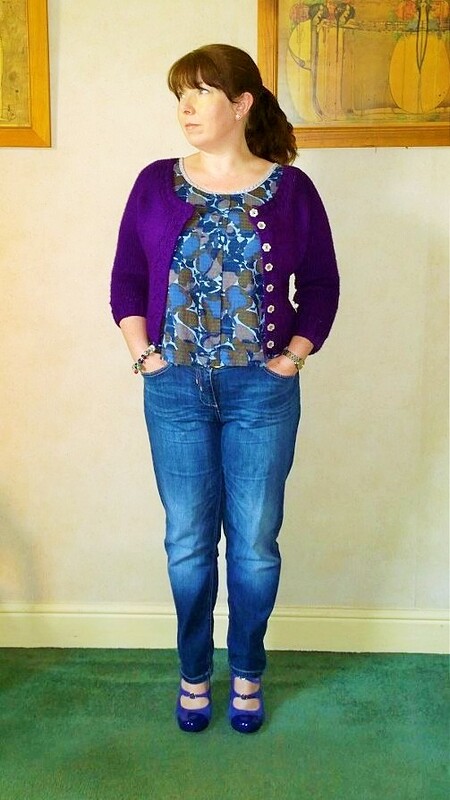 Me Made May has made me think a lot more carefully about what I wear, I had got into the habit of wearing jeans, plantains and Miettes all the time! 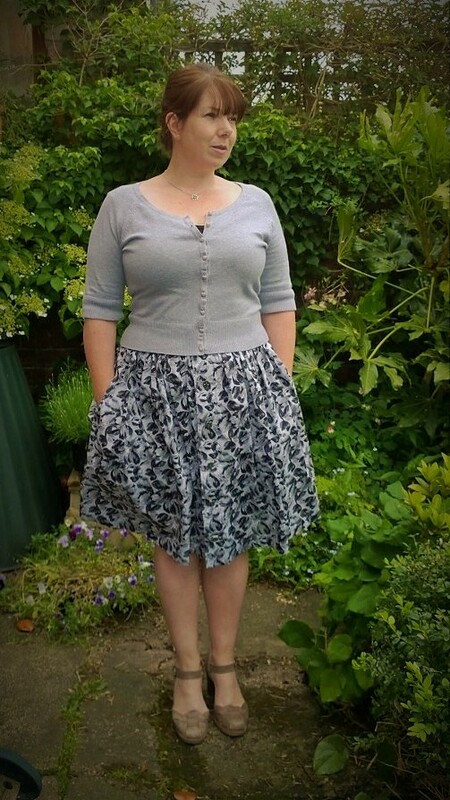 It’s been nice to wear more skirts, I could really do with sewing a few more. 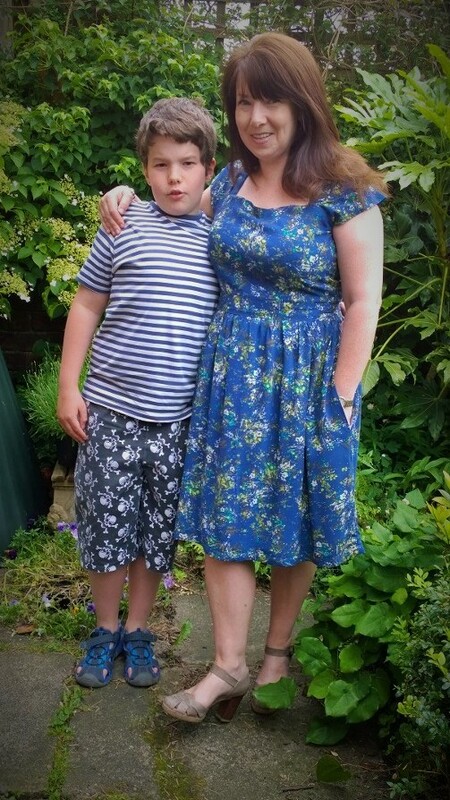 My most me outfits so far have been my Darling Ranges and Anna Dresses, I just feel a lot more comfortable in dresses and I don’t have to thing about co-ordinating anything! I’ve also realised how much I love my Miettes so I definitely need to knit at least one more! I’ve just got to see if I can make it through the next two weeks without repeating anything! Hopefully the weather might warm up a bit so I can bring out more of my summer stuff! Are you taking part? Have you managed to stick to your pledge? 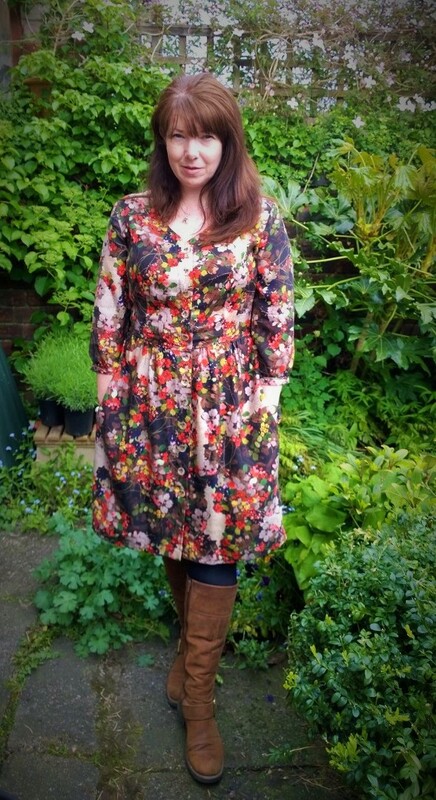 Swishy By Hand London Anna Dress! Don’t you just love wearing a new dress for the first time? Especially if it’s a swishy one! 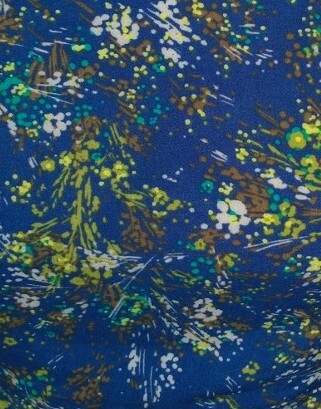 I bought this fabric in November when I was on the hunt for winter type stuff. 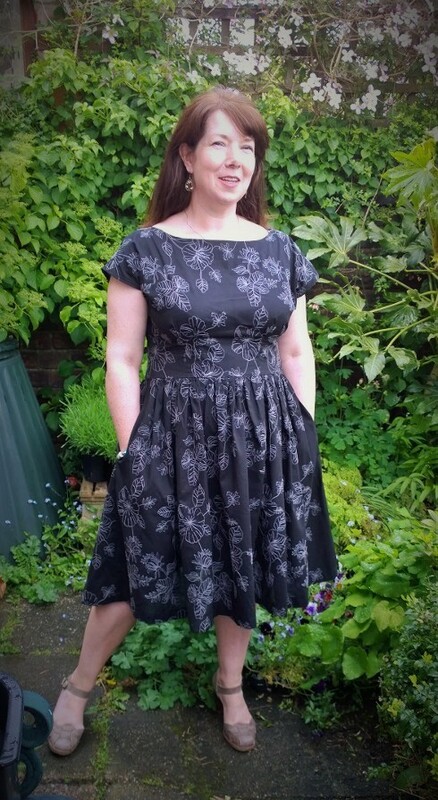 I knew it was too light for the time of year but it just screamed ‘make me into an Anna dress!’. I took it home and put it away waiting for spring to spring so it could fulfil it’s destiny. It’s a very fine black cotton which ‘had’ white embroidered flowers all over it. However, after pre-washing it the white is now a distinct shade of grey! I had originally planned to make a maxi but after much thought decided that cutting the fabric into the panels required would break up the embroidery too much. 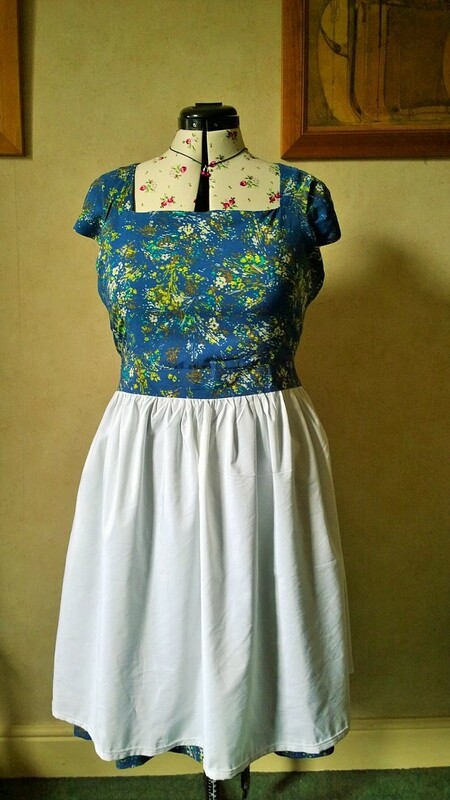 I decided to go with plan B and pair the Anna bodice with a simple gathered skirt instead!. 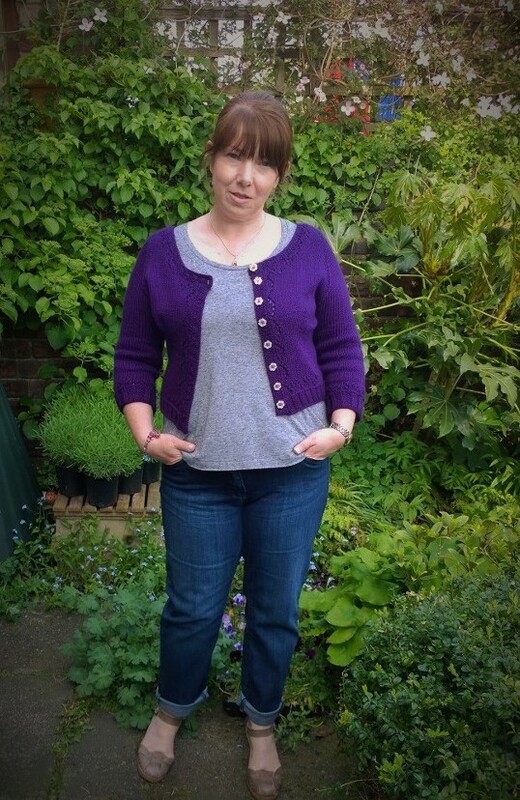 I cut a UK size 12, the same as my previous Anna which still fit’s (I checked!). The bodice went together like a dream, the tucks at the front give it such a great shape. When it came to making the skirt I just used the whole width of the fabric for the front and divided the width into two for the back pieces. I always mean to draft a more reserved skirt but when it comes to it I end up using as much fabric as possible to make as full a skirt as I possibly can! 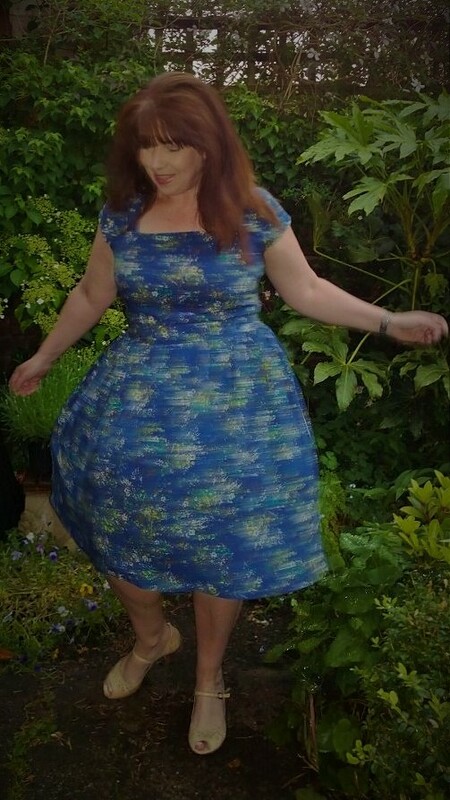 This one is a full three metres in circumference, lot’s of swishing to be done in this dress! I added inseam pockets because I don’t know what to do with my hands without them! 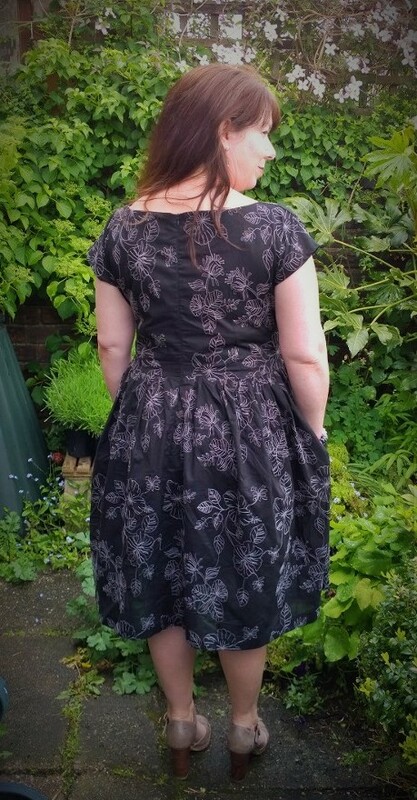 I’ve stopped wearing a couple of my previous makes because they don’t have pockets and I seem to spend the entire day rubbing my hands on my hips looking for imaginary pockets! I overlocked all my seams, when looking at my original Anna I noticed everything had been french seamed, it did however take me four days to make. This on the other hand was cut out and together in just over four hours, big up to the overlooked for instant gratification! I did have to have two goes at putting in the invisible zip. The first go the fabric puckered quite badly so it was out with the unpicker. Second time around was a bit better, not perfect but good enough for me. I should have really interfaced the seam allowance at the centre back but I was too close to the finish line! 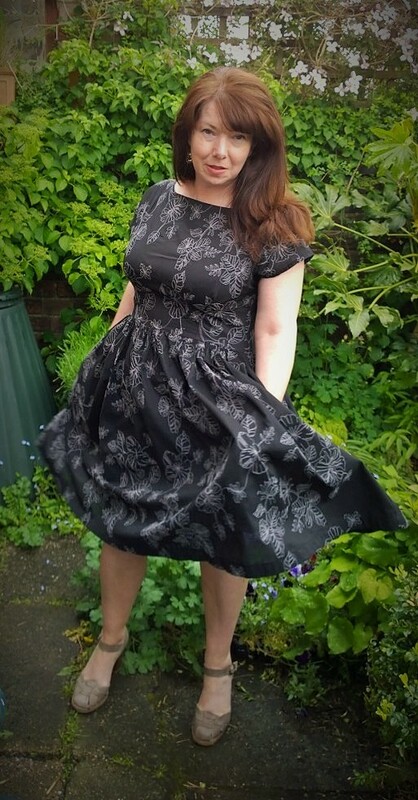 I wore it out to lunch today and have taken every opportunity possible to twirl and swish, although I did have a couple of close calls when the wind took hold, always forget the perils of wearing a full skirt in windy weather! Look a little crumpled from behind but I had been sitting down a lot! Overall really pleased with it. 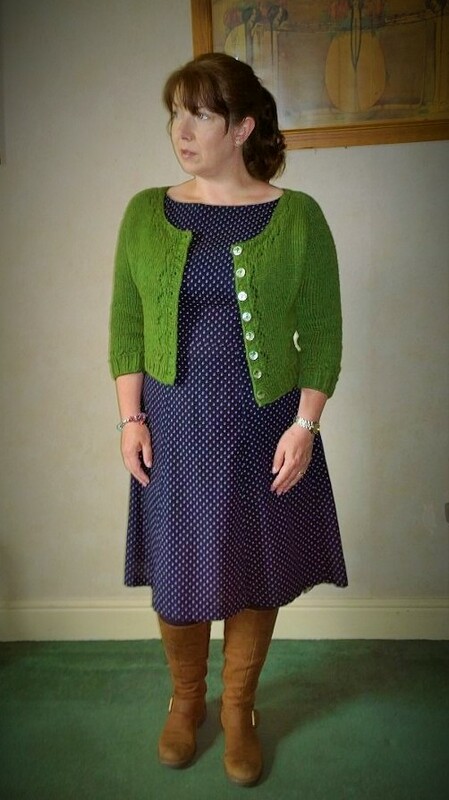 I’ve also realised I could have got away with making it in November and wearing it with tights and a cardigan, will have to re-name it my swishy year round Anna! 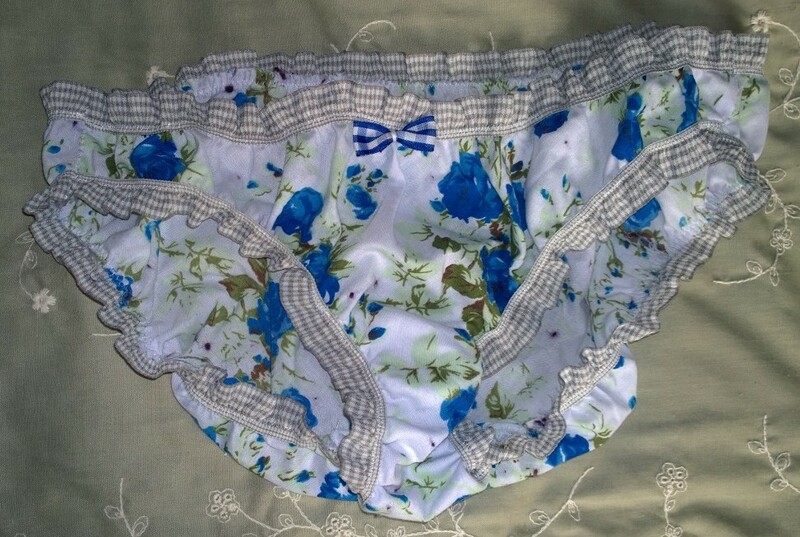 One of my new year plans that has been successful has been my pledge to make my own undies! It’s such a brilliant pattern as you can squeeze a pair out of a fat quarter. The black and white fabric was left over from my Tilly picnic blanket skirt, the navy came from my culottes, quite love the idea of wearing matching knickers! As you can see the elastic is a bit saggy but they are wearable. Part of my me made May pledge has been to wear me made knickers everyday, six pairs seemed to be enough but I think I might need a few more for variety! Off to rummage in my scrap bag for inspiration!